This meeting has certainly become a firm fixture for NHBS members in their social calendar. I think the last meeting (May 2007) was even better attended than 2006 and even the weather did not serve to dampen anyone’s spirits, with this week marking the start of the wettest summer in living memory. Left, the Sylvester Horne Institute; the venue of the Church Stretton Meet. 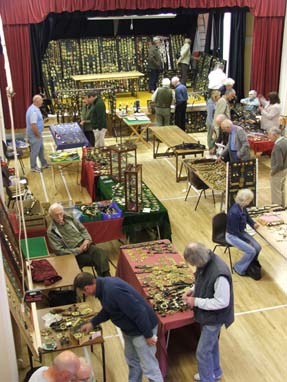 The stalls in 2006 need no description from me as I can add a photo or two which gives us an idea of some of the items on offer here. We can also see the sheer scale of Mark Roberts’ fantastic collection, which was, once again set up in all its glory on the stage for us to marvel at. It is amazing to think that this was Church Stretton No. 6, and, like all the other meetings I always find this day such a pleasure. I suppose, as always, it is the meeting of old friends, the banter, and the sheer entertainment value that is the most important thing. As always, I realise that I am already looking forward to next years’ meeting with just as much anticipation as I had for today’s get together. As I drive home I also realise how easy it has become to take these meetings for granted so take a bow all those that arrange and attend and receive a hearty “well done” for always making this meeting such a success. Left; Mark Roberts and his collection, which always takes several hefty members to cart it in. 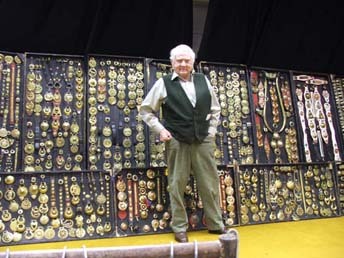 Collections like these are of course the stuff of legend and many members are heard to comment which specimen they would most like to add to their own collections. This collection is always a pleasure to see, so well done Mark, we hope to see you again at the 2008 fixture in May.